Birzzle, from Enfeel Inc., is a cute new app for the iPhone and iPod Touch that appears to blend adorable birds, match-3 gameplay, and Snoop Dawg naming sensibilities. Don’t get too excited though, hip hop fans, because the game is less bling-bling and more Bejeweled Blitz. Although the initial game looks a lot like your standard match-3, gameplay is a little different than usual. You’re still out to make matches of 3 or more, but instead of swapping color-coded birdies, you can drag and drop them accordingly. So long as a bird is “open”, either on the top or the sides, you can slide it to a different open spot in the grid. Gravity is always at work though, so if you pluck a bird out from a column, expect the rest to drop down a notch. Birds don’t have to be in a straight line to match, just grouped according to color. Matching 3 removes the birds from the board, but matching 4 and up will create a special power bird that can be used to take out larger chunks of the board when used in a match. Matches take a second before they go, so you can use that time to tack on extra birds and make bigger combos. The power birds become the key to your survival as the game progresses. New birds drop down from the top as time passes, so you have to work quickly if you don’t want to find your screen totally filled up. The order is totally random, and as you level up, new colors of birds start to be introduced. If you get good enough at normal mode, you can unlock their “Ice Break” mode, which is generally similar to the regular game, but the gmame mechanics are slightly different and there’s a much stronger time attack element to it. Now, simple puzzle games like this cluster around the App Store like flies on poop, so don’t expect a mind-blowing amount of originality here, but Birzzle does have a few things going for it. First, the graphics are super cute and polished, on par with, say Piyo Blocks 2, but without the retro feel. Second, the change in game mechanics is just enough that you don’t feel like you’re just playing Bejeweled again, but not so different than you can’t use it to just zone out for a few minutes. Overall, it’s not a bad game. 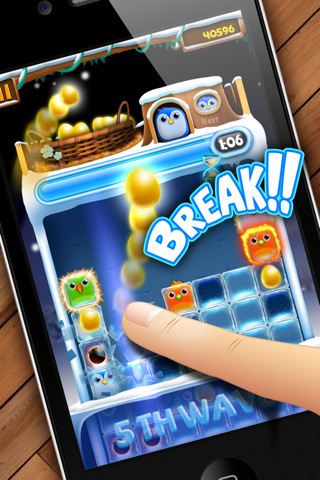 It’s definitely more adorable than innovative, but it delivers a solid puzzle game experience. Decent touch controls + cutesy graphics = slightly bland, but still pleasantly light entertainment. Sample the free version of Birzzle on your iPhone. 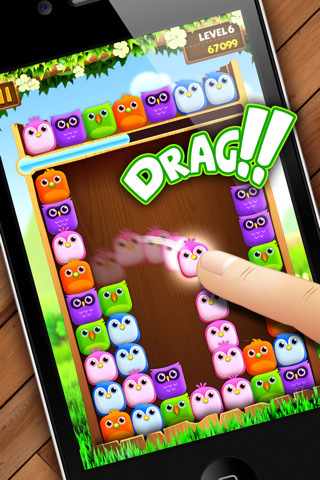 AppSafari review of Birzzle was written by Tracy Yonemoto on April 29th, 2011 and categorized under App Store, Games, Puzzler. Page viewed 4800 times, 1 so far today. Need help on using these apps? Please read the Help Page.